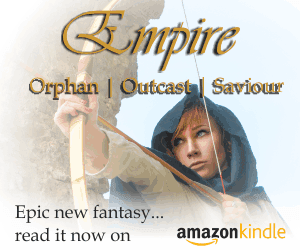 Pros: Outstanding image quality for the price, the Eden is full of surprises. Robust, yet lightweight this is an exceptionally comfortable binocular to use and carry in the field for extended periods. Bright, clear, sharp image which packs in detail across a wide range of light conditions. Cons: Hard to fault the binocular itself at this price… but the supplied accessories don’t really live up to the quality of the binocular. If I’m being picky then there’s some moderate chromatic aberration on very high contrast subjects if you look hard for it, and a very slight warm colour bias… but nothing that impacts the binocular’s effectiveness in the field. Things are getting interesting at the lower end of the quality binocular market. Features and techniques pioneered by leading manufacturers in pursuit of optical excellence are getting cheaper, and are trickling down to binoculars that are much more affordably priced. The result is increasingly capable optics are falling within the financial scope of a much broader swathe of wildlife enthusiasts. So when online retail group Kato contacted me to ask if I’d review a pair of their new Eden Quality XP range of binoculars I was delighted to accept. Retailing at GB£245, the XP is the new flagship model of the Eden Quality optics range, which is only available online through Eden Webshops. We have our Eden Quality binoculars specially produced by a manufacturer who also produces a large number of well-known brands. This cuts out a brand and a distributor in the sales chain and that means that the price advantages is yours! That is why these binoculars are comparable with binoculars that cost a great deal more. I was intrigued to see if the binoculars would live up to that promise. First things first… before the binoculars arrived… before they were even posted… I had reservations around the brand name. Any product with “quality” in the title sets off little alarm bells. You shouldn’t need to specify “quality” in the name: quality should be immediately apparent when you pick up the product. Eden Quality XP 8×42 smacks of the gimmicky embellishment of less-than-subtle marketers. A simple Eden XP 8×42 is much more elegant, and much more effective. That said Kato Group is a Dutch company, so I suspect the marketers in question may not be native English speakers, and the feature list looked good, so I decided to hold my reservations in check and let the binoculars’ performance in the field do the talking. 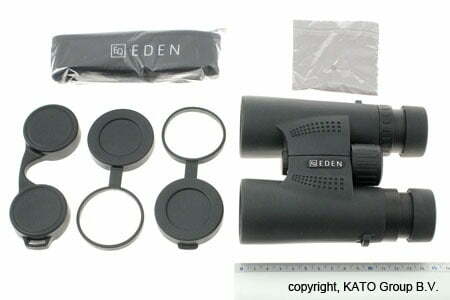 Eden Quality Binoculars: What’s in the box? The binoculars arrived in a plain mat-black box with the usual range of accessories – a padded neoprene neck-strap, tethered objective lens covers, a rain-guard for the ocular lenses, a micro-fibre cleaning cloth and a soft carrying case. The first thing you notice about the binoculars is the impressive build quality. They feel solid and well made – surprisingly so at this price point – and robust enough to take a hammering in the field without getting damaged. In terms of design they are a traditional centre-hinged roof-prism binocular… very compact for a full-size binocular and surprisingly lightweight at just 660 grams. According to the spec the weight saving comes from the all-new carbon-fibre reinforced polyphenylene sulfide (PPS) body, rather than any compromises in the quality of the optical components. All in all I like the look of the binoculars – although I have to say they look sleeker with the eyecups twisted down flush with the body than when they’re standing proud in their in-use position. The lens caps and rain-guard are pretty standard fare and typical of the kind you’ll find with most mid-range optics. The neoprene strap is wide and comfortable, but the finish could be a little better in a package costing around €300, and I felt that the webbing part of the strap – the bit that attaches to the binoculars – was a little on on the light side. The soft case fits the binoculars snugly – a bit too snugly perhaps. Bizarrely you have to twist down the eyecups when putting the binoculars into the case otherwise it won’t close. There’s also no room in the case to fold in the strap once it’s attached to the binoculars. In practice this isn’t a problem for me, as once a pair of binoculars comes out of its case it rarely, if ever, finds its way back in there unless it’s going into storage, in which case folding down the eyecups really isn’t an issue. Overall the binoculars score highly in terms of first impressions… let down slightly by some of the supplied accessories, which while more-or-less functional, don’t have the same quality feel to them as the instrument itself. 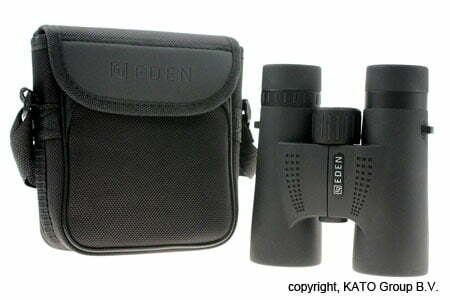 The Eden Quality XP 8X42 is an incredibly comfortable binocular to use. It is very well balanced, and its light weight means carrying it around in the field all day is no problem. It sits nicely in the hands, and the rubber armouring gives plenty of grip even when wet. The central focusing wheel is exceptionally smooth and has just the right amount of resistance, and no “travel”. 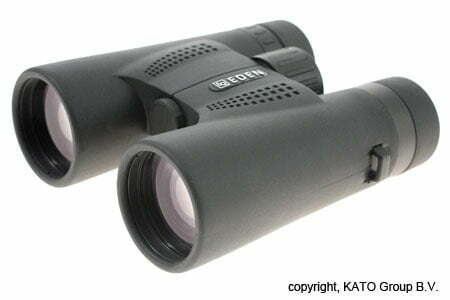 It’s as good as any I’ve ever used, including on top-of-the-range “Alpha” class binoculars. The focus itself though is a bit on the aggressive side. With only a single 360 degree rotation end-to-end it’s incredibly quick. In practice about three-quarters of a turn takes you all the way from an impressive close-focus distance of about 1.5 metres (I couldn’t focus down to the advertised 1.2 metres, but got so close it makes no difference) to infinity. It takes a bit of getting used to, and can lead to overshooting the point of focus when you first start using it. With a bit of practice, however, it’s no problem getting pin sharp focus very quickly, and “quick” focusing is handy when you move from watching a butterfly at your feet to tracking a falcon speeding overhead. One other thing to note here – the focus turns anti-clockwise to infinity – that’s the opposite of my primary binoculars, but the same as my pocket binoculars. If you’re more accustomed to focus that turns clockwise to infinity it can take a bit of getting used to, but isn’t a problem for long. The right-eye dioptre adjustment is situated in the traditional location on the right-hand ocular, and according to the manual is lubricated with a “special grease” that releases to move freely when you turn the dial, but hardens when left alone to prevent accidental movement. This sounds a bit odd, but in practice works flawlessly. Adjusting the dioptre was smooth and hassle free, and once set I never had an issue with it slipping. Now to the meat of the review. Just how does the view through these binoculars stack up in the field? For the price I was genuinely surprised with the quality of the image the Eden binoculars rendered. It was superbly sharp with lots of detail, a good wide field of view and very good edge sharpness overall. There was some fall-off in sharpness in the outer 10% or so of the field, but in the very large central “sweet spot” the image was truly excellent. In the week I’ve had them I’ve used the XPs extensively in the field in a wide variety of lighting from bright sunshine to pouring rain (it’s Summer in Ireland after all) to twilight, and doing everything from seawatching on a headland to birding in mixed woodland to watching butterflies in the back garden. The Edens delivered a consistently sharp image and were a pleasure to use in all sorts of field conditions. I think they have the best close focus performance I’ve ever seen. One of the defining factors that separates the great from the good in the world of sports optics is the feeling of immersion. With good binoculars you feel like they’re magnifying the view, but that you’re still looking at it from a distance. That, of course, is exactly what’s happening, but great binoculars transcend that reality. They make you feel like you’re in the middle of the action, immersing you in the experience. The Eden Quality XP 8×42 come very close to delivering that level of immersion. Almost… but not quite. The image through the XPs is excellent, but it’s not flawless. If you look for it there is a moderate amount of chromatic aberration around the edges of very high-contrast subjects. Look at a distant hill backlit against a bright overcast sky and you’ll notice colour fringing running along the ridge-line. In practice this isn’t likely to present a problem unless you’re eyes are particularly sensitive to chromatic aberration. I only noticed it because I was actively looking for it as part of this review. It does, however, beg the question why Eden, who had ED glass in their previous flagship model, chose to omit it from the optical system of the new XP. ED glass helps to minimise chromatic aberration, and improves image resolution. Its inclusion would surely have given the image through the XPs that slight but significant lift that would elevate it into the realm of a great pair of binoculars. The other slight gripe I have with the Edens is colour fidelity. Accurate colour reproduction can be crucial for wildlife viewing, particularly with birds, where subtle plumage variations can make all the difference to correct species ID. Colours through the Eden are bright and vibrant, but to my eye they are skewed slightly on the warm side of neutral. That means reds and greens tend to “pop” – appearing slightly more luminous than they do to the naked eye. The result, ironically, is quite a pleasing image – just not one that’s 100% accurate. The colour bias is slight… but it is there. It’s particularly noticeable when you compare the binoculars side-by-side with colour-neutral optics. That said if you’re using the Edens exclusively, and not making direct comparisons, the effect is very subtle. It’s unlikely to lead to incorrect identification in the field, and unless you’re looking for it it doesn’t detracts from the enjoyment of using what is undoubtedly a fine pair of binoculars. One other thing of note is that Kato Group stand over the quality of their Eden Quality brand with a comprehensive 25 year guarantee on materials and workmanship. They will repair or replace any Eden Quality XP that develops a fault within that time free of charge. That’s a better guarantee than that offered by most top-line optics brands, and says a lot about the company’s confidence in the durability of its product. The Eden Quality XP 8×42 is a very accomplished all-round package. It feels solid and well made, is very comfortable to use, light weight and delivers exceptional optical performance for the price. The downsides are few: namely the moderate amount of chromatic aberration (which you’d expect with any binocular at this price point) and a very slight colour bias, which in practice isn’t likely to impair their optical effectiveness in the field. One other slight disadvantage is the fact that the Edens are only available online. Cutting out the middleman undoubtedly saves you money, but it does make it difficult to try before you buy. Based on my experience with the review pair however, I’d certainly recommend adding the Eden Quality XP 8×42 to your shortlist if you’re shopping for high performance all-purpose binoculars in the €300 price bracket. *: The Zeiss twilight factor indicates the suitability of binoculars for twilight use.The twilight factor is calculated by applying the following formula: square root of the magnification x objective diameter. Great review Calvin. I read through waiting for the “but” . I was surprised to hear they hadn’t gone for ED glass, doesn’t seen to make much sense in light of past top end models they’ve produced. The 25 year guarantee was a nice surprise though, similar placed models from other manufacturers often only come with 10 years or some as low as 3 years. Thanks Floss… I kept waiting for the “but” too — but the Eden’s just kept delivering. A few minor foibles was all I could fault them on at the price. Have let Nikon UK know that we’ve had requests to review the EDG, so will see what they say. Meanwhile you’ll have to make do with Swaro EL32 Swarovision and CL Companion reviews in the not too distant future.